In other words, how does the way in which adolescents perceive or attend to stimuli, such as faces, impact neural circuitry function that underlies avoidance or approach responses? How does this play out in adolescents as they age, or in adolescents who have social-emotional difficulties? A second overarching question is how do different patterns of response in emotional circuitry relate to each other? To that end, Dr. Guyer is interested in identifying common and unique response patterns in neural circuitry that emerge with anxiety and with risk for anxiety as well as using context to manipulate how social cues are processed and how such manipulations modulate different patterns of neural responses. She has examined age-related differences in the neural substrates of face emotion processing in typically-developing adolescents, as well as in adolescents with anxiety disorders and in adolescents characterized by their early temperaments. A current approach Dr. Guyer uses to address her research questions involves simulating adolescents’ daily social lives by using a neuroimaging task that measures how adolescents respond to the anticipation and receipt of peer evaluation. New Video Series Provides a Foundation for Understanding Poverty in the U.S.
DAVIS, Calif. — In this new video series released by the UC Davis Center for Poverty Research, Faculty Affiliates discuss some of the causes and consequences of poverty in the U.S. as well as possible solutions suggested by research from across academic disciplines. 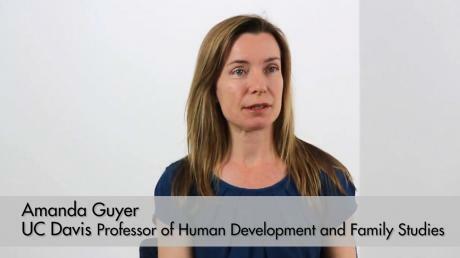 In this video, developmental psychologist Amanda Guyer describes the impact growing up in poverty can have on brain function and how the stress of life in poverty affects people’s lives. In this podcast, visiting scholar Stephanie Jones and Amanda Guyer, a UC Davis Associate Professor of Human Development and Family Studies, discuss the long-term impacts of poverty and violence on social and emotional development in a conversation that ranges from classroom interventions to cross-disciplinary research into non-cognitive skills.